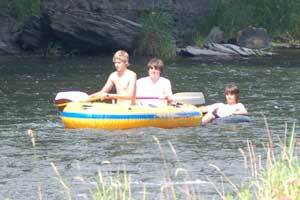 The most popular boat trip is from Ansonia to Blackwell through the wilderness section of the PA Grand Canyon. The distance is 18 miles and it normally takes 4-5 hours to run. 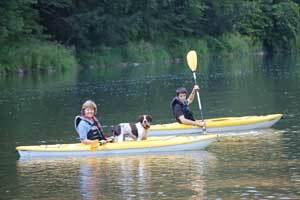 Boat rentals and shuttle services can be purchased at Pine Creek Outfitters in Ansonia. The prime time to run the canyon is March through May, because good water levels are very likely. Be sure to use a wetsuit during the early spring. If you don't have time for the canyon trip, there are several shorter excursions. Our family members love to take a leisurely afternoon float from Blackwell to Rattlesnake Rock or to Cedar Run during the summer. Because Babbs Creek flows into Pine Creek at Blackwell, this stretch has adequate water for boating during most of the summer. Don't forget to stop for ice cream at the Cedar Run General Store!